ST. PAUL, MN (November 21, 2016) — Teens will participate in financial literacy workshops as a part of their employment at a celebrated North Minneapolis non-profit bakery, thanks to grant funding from the Affinity Plus Foundation. 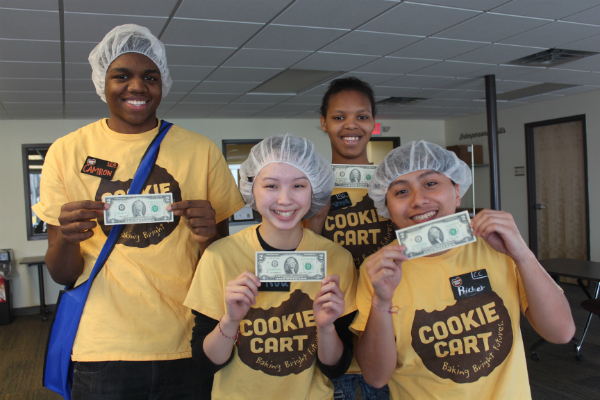 For nearly two generations, Cookie Cart has provided teens ages 15 to 18 with real-world business skills, leadership training and an opportunity to participate in their neighborhood economy, said Matt Halley, Cookie Cart executive director. The foundation grant will help strengthen the bakery’s workshops and classes, Halley said. According to Cookie Cart’s website, Sister Jean Thuerauf used baking cookies in her home as an entry point to help North Minneapolis teens have a “safe and engaging place to spend time [and] engage in education and empowering activities”. In 1988, Cookie Cart registered as a community non-profit. In 1996, it relocated to its current location on 1119 West Broadway Ave.
Halley explained that thousands of North Minneapolis youth have been impacted by Cookie Cart’s program. In 2015, Cookie Cart engaged 193 youth employees in 35,328 hours of hands-on work and classroom experience. Youth employees participated in 184 community engagement activities such as sales events, workplace visits and other community events. Eighty four teens completed financial literacy training in 2015. As a follow-up, 95 percent of youth employees reported they were ready to find and keep a job after going through Cookie Cart’s programming. To learn more about Cookie Cart, go to cookiecart.org or call (612) 521-0855. Founded in 2000, the Affinity Plus Foundation is a 501(c)(3) serving Minnesota communities. The Foundation proudly administers its own scholarship program, awards grants to non-profit groups and schools, and supports financial education initiatives through partnerships, presentations and resources. The Foundation operates on funds generated from its annual golf and fishing tournaments; annual silent auction; from Affinity Plus Federal Credit Union; and from generous donations from community members who believe in and support financial education.